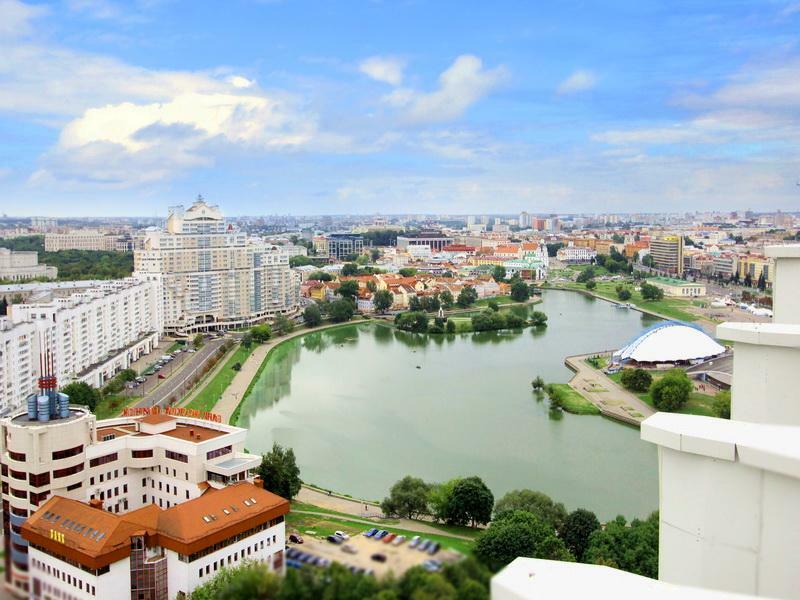 During the excursion Minsk will open before you the person: wide avenues and cozy streets, a variety of architectural complexes and parks. For the long story of existence the city was repeatedly destroyed, burned, but every time it revived and built up. 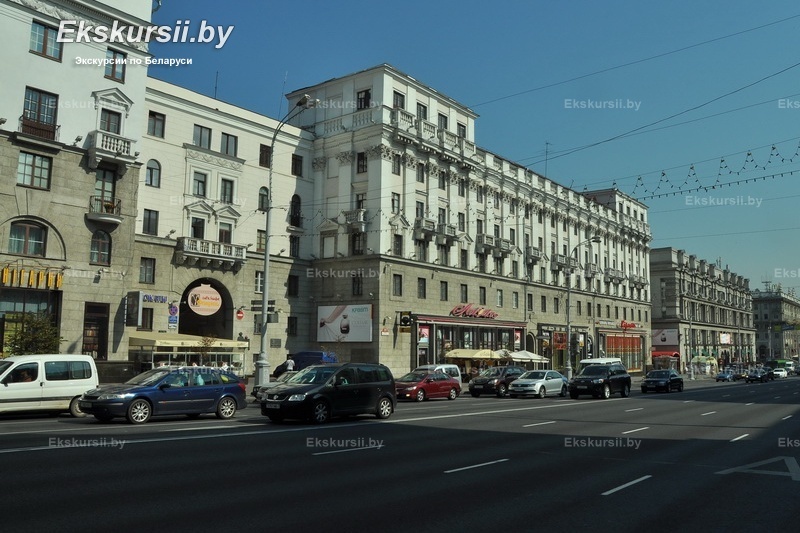 And today Minsk is a modern European megalopolis with the multimillion population. He develops and becomes promptly more beautiful, combining greatness of heritage of old times and an innovatorsky thought of the present. Privokzalnaya Square – the person of the city, the place of meetings and wires. As a human face, it grows old and changes from time and events. However talent and skill architects inhale in it new life again and again. And today, at an exit from one of the best stations of Europe, before you magnificent «gate of the city», the spacious area and the developed infrastructure open. 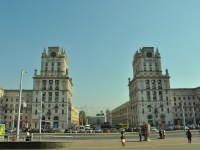 The modern building of the railway station organically fits into ensemble of magnificent Stalin classicism. If outcomes of roads are thought up for unloading of streets, then the area – for «unloading» and rest of people. 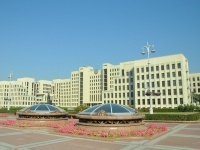 One of them – Independence Square. 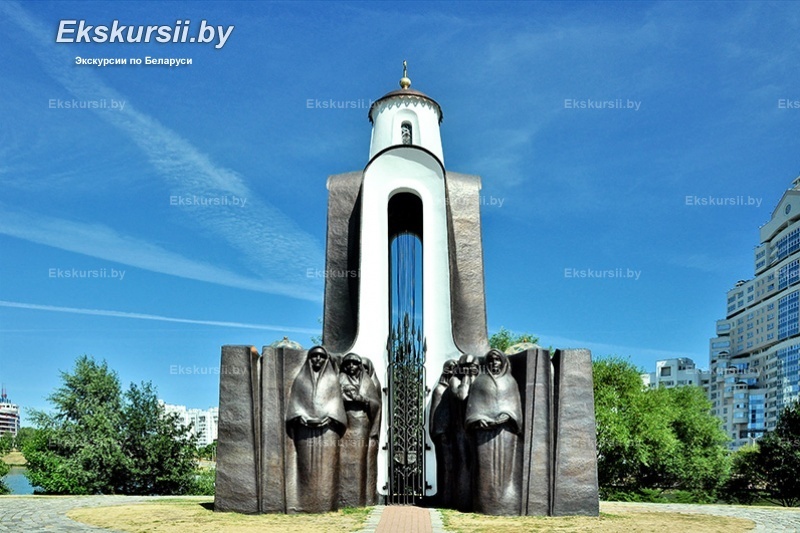 Having taken a place of honor in the downtown, it collected around itself a set of sights: the most beautiful church of Minsk and the oldest university, government buildings and the biggest monument to Lenin in the former Soviet Union. The modern landscape was added by lawns of greens and fountains, cozy shops and glass domes of the three-storyed shallow city – Shopping Center Stolitsa. The eponymous handout originates from Independence Square though earlier it changed the name 14 times. 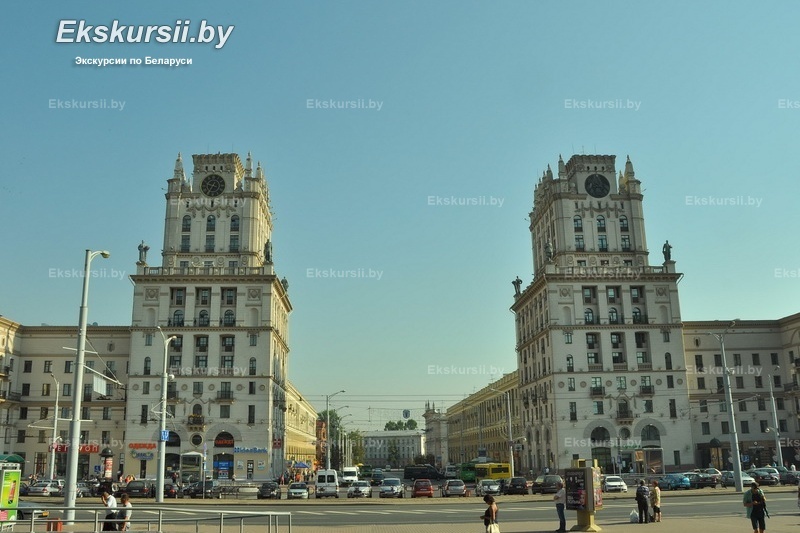 It is the central and largest highway of Minsk, the large-scale work of art and the keeper of memory. He remembers a great number of politicians, writers, artists … Nezavisimosti Avenue - the only example of so long site of urban development where it was succeeded to keep unity of a form and style fully. The avenue applied for entering into the List of the World heritage of UNESCO. 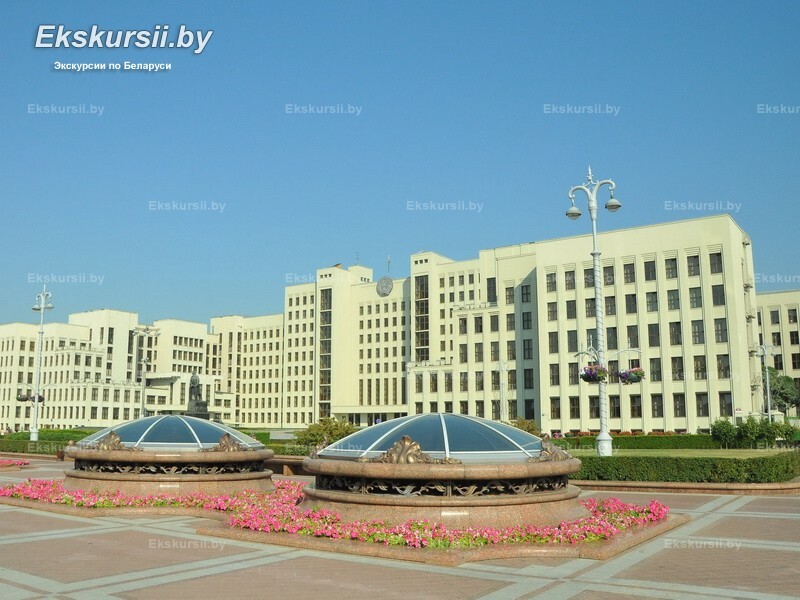 Not each city can brag of 2 centers – the Belarusian capital was lucky here. 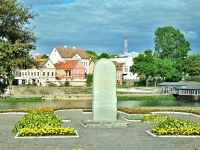 Besides the modern center with the Government house, the historic center with a symbol of city self-government – a town hall remained. The graceful small streets surrounding it with fancy lines of houses, medieval temples and monasteries – all this gives to Liberty Square special unique color. From all city not only tourists, but also locals are flown down here to feel spirit of old times and to enjoy live music of streets. The small hill on Svislochi Embankment and also the model of the base of the first city temple in natural size – here, perhaps, all that reminds today of medieval fortress. According to one of versions, ancient Mensk which was built up at merge of two rivers and is surrounded with an earth shaft is founded here. Anyway, the place this picturesque is also fanned by legends and legends. At the beginning of the 16th century, on the hill that towered over Svislochyyu, Trinity Monastery with church was built. Around them the residential quarters were formed that and was called – Troitsk. Time kept for us the Troitsk suburb with its multi-colored lodges and quiet picturesque small streets. Today it is a monument of architecture and culture of the international value. The stylized coffee houses and the museums postpone us to a moment ago in the 16th century where day after day the great history is written. At an entrance a big boulder with the walled icon. Under an icon the text: «To the sons who died in Afghanistan the temple is built it. That the evil was not neither on the, nor on others earth». 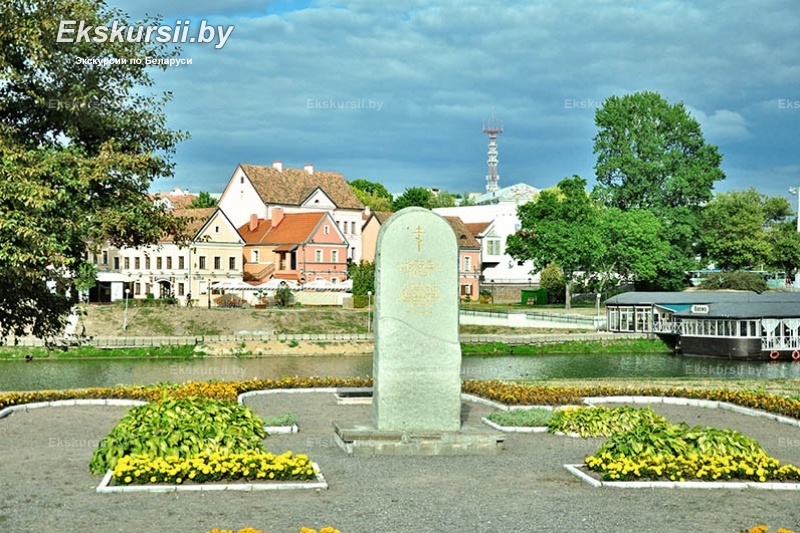 And a black kaplitsa with a bell and the crying guardian angel … This place of memory and grief about 3 thousand Belarusian children that will of destiny became soldiers internationalists and died in the mountain wild land. It is the Island of courage and grief – the island got down. 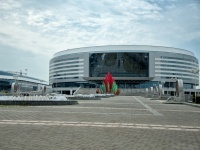 It is continually heard here «White-blue – the strongest!» The home arena of HK «Dynamo» and one of the most modern constructions of Europe, for holding the international sporting and cultural and entertaining events – the Multipurpose cultural and sports Minsk arena complex. The architect Valery Kutsko created a unique monument of modern architecture – style hi-tech. 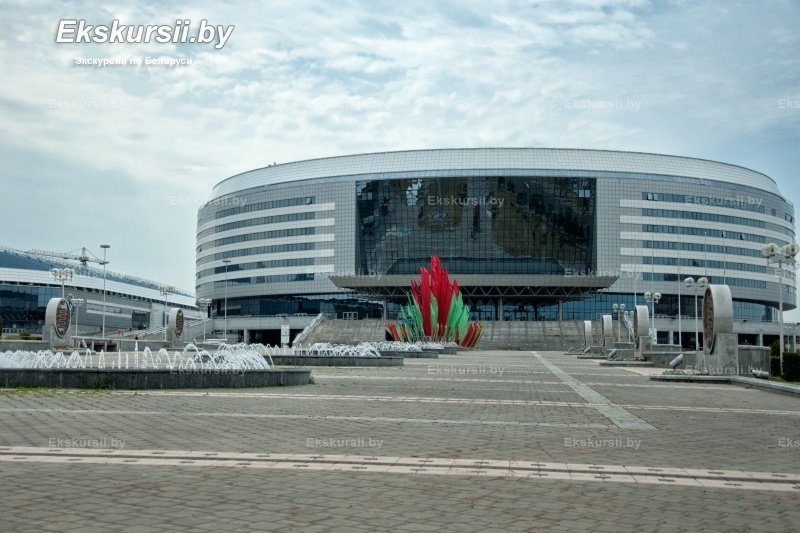 The arena surpasses by the beauty, design, functionality all previous sports constructions of Belarus. Since 2010 it became the platform of a set of world and significant sports competitions and the largest concert venue. 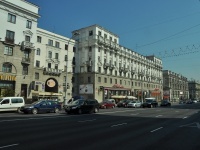 A row located the avenue of Sports glory and a stele «Triumph». «You love the book because it - a source of wisdom, knowledge and science, medicine as a hobby» - was recommended to us by the Belarusian first printer Francis Scorina. He will meet you at a main entrance in National library of Belarus. It became not only storage of any type of books, but also a monument of modern architecture. To look at it guests of their different cities and countries of the world gather. And the open survey area where from height of 73 meters it is possible to look at Minsk crowns her - excellent types will open to you as in day, and in the evening. If desired you can visit her on the end of an excursion. 02-February-2019 Гид Степан провёл экскурсию на отлично - интересно, занятно, увлекательно. Бронирование экскурсии было легко, ответы менеджера быстрые, вежливые. 07-January-2019 В восторге от экскурсовода по г. Минск (07.01.2019), грамотная, обаятельная !!! Все очень понравилось!!!! 06-December-2018 При бронировании экскурсий на все заданные нами вопросы мы получали квалифицированные и своевременные ответы. Очень довольны экскурсоводом Алексеем, очень грамотный и профессиональный специалист. 12-November-2018 Единственное замечание к Алексею: нужно давать время на фото.